Bedtime Stories had already proven that Madonna had calmed down a bit after the raunchy Erotica period. On November 7, 1995 she took it a step further and used her new-found calmness to release a collection of her best ballads. "... So without a lot of fanfare, without any distractions, I present to you this collection of ballads. Some are old, some are new. All of them are from my heart." Fans that love the controversial Madonna probably cringed while reading this. But it's a fact that Madonna made some great ballads. 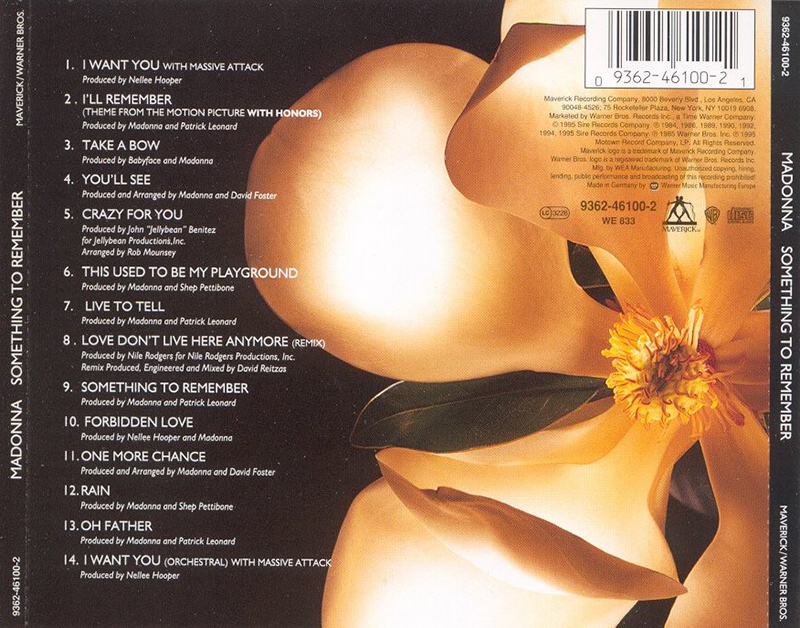 Most songs selected for Something To Remember came from a movie soundtrack and some hadn't even appeared on a Madonna album before. Crazy For You was from Vision Quest (and appeared on The Immaculate Collection), Live To Tell was from 'At Close Range' (and appeared on True Blue and The Immaculate Collection), I'll Remember had only appeared on the 'With Honors' soundtrack and This Used To Be My Playground was written for A League Of Their Own. Madonna added one of her early songs Love Don't Live Here Anymore (previously featured on Like A Virgin) and released it 12 years after recording the original. She also re-released Oh Father, from the Like A Prayer album. Something To Remember was a song from I'm Breathless and was probably included because of the convenient title. Rain was practically the only ballad on Erotica while Forbidden Love and Take A Bow were taken from the most recent album Bedtime Stories. The most interesting on the compilation album were of course the three new songs. Madonna collaborated with producer Nellee Hooper and Massive Attack for I Want You. This cover of the Marvin Gaye classic was initially intended to be released. Instead WBR opted for You'll See, a great song which became a fairly successful single, especially after the poor chart results of Bedtime Story and Human Nature. And finally, One More Chance was another new track, beautiful but often forgotten, that got a limited single release. Those last two tracks were produced by David Foster. The Japanese version, of the album contained La Isla Bonita as bonus track, while the 15th track on the Mexican version was Veras, the Spanish version of You'll See. In the album charts, Something To Remember reached #1 (Australia), #2 (Germany), #3 (France, UK), #4 (Canada), and #6 (US). In October 2000 it was last certified triple Platinum for shipments of 3 million US copies. Worldwide it sold about 8 million copies.